The perfect-fitting ski boot can be elusive, even when you own a boutique ski boot company with a money-back satisfaction guarantee. Based in Vermont, Dodge Ski Boots only sells boots online or at their factory fit centre. 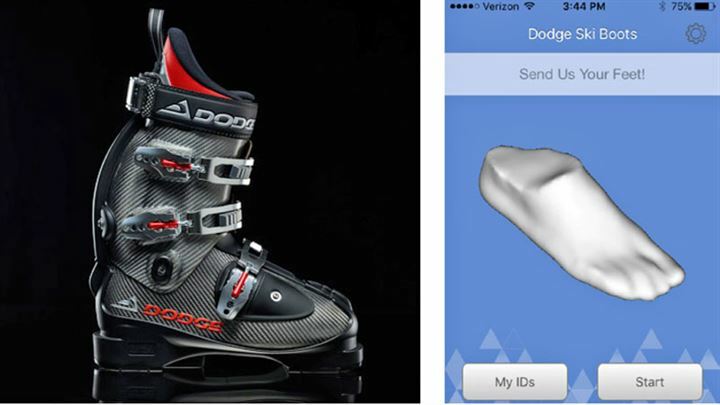 They took some of the guesswork out of fitting a ski boot without a physical foot by designing their boots on a computer rather than with a physical mould, as most manufacturers do. Online customers would send in pictures and drawings of their feet and Dodge Ski boots would compare them to the CAD drawings to best match size and shape to dozens of shell and liner options. It worked pretty well, but, as Dave Dodge demonstrates, there was room for improvement. The Digital Fitting App is a leap forward. It guides customers in taking pictures of their feet and then stitches them into a 3D image. Back at Dodge the foot image is laid over the CAD image of the boot, helping to not only match the right liner and shell to the foot, but also guiding post-production customizing. Because the boots are made from carbon fibre, they require more precise shaping than the “punching” a ski shop can provide.